← What Are My Blogging Goals? Cooking has certain advantages over writing. While you stand over your two-minute egg you can cha-cha-cha. If you forget your glasses in the bathroom, you can still rinse red lentils. Cooking is more sensual than writing. You can taste the cherry tomatoes before you throw them into the pot. You can smell the fresh basil, fondle the parsley, listen to the bubbling of boiling rice. Even the tools for cooking are more fun than a pen or a computer. Consider the ceramic white bladed knife with orange handle I recently purchased. 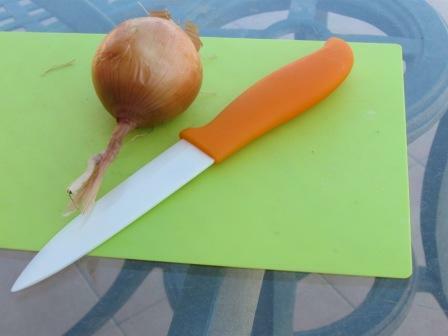 The knife glides through the skin and innards of an onion with the ease of a surgical blade. Examine the new veggie chopper with its own clear plastic measuring cup. The chopper makes neat incisions and comes with its own cleaning brush!You get more exercise when you cook than when you write. Crushing garlic strengthens the muscles of the arm in a way that typing never could. 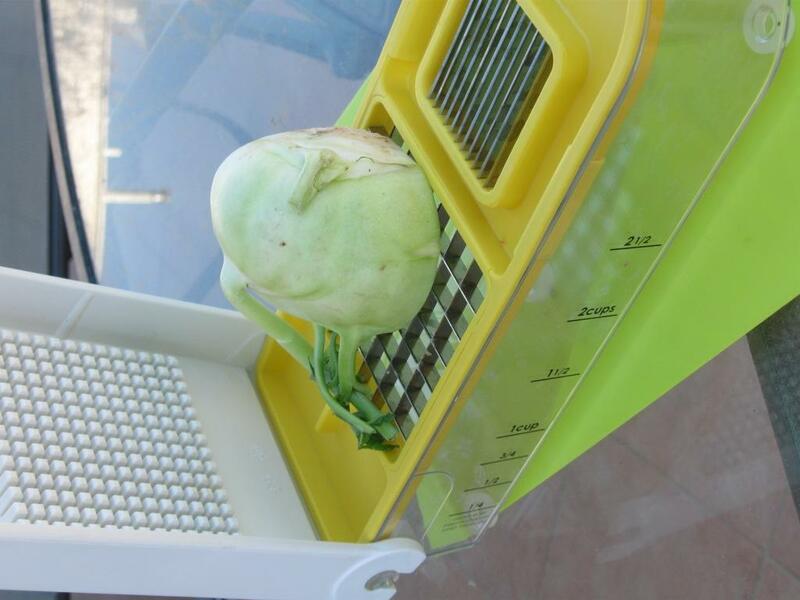 Using the new veggie chopper demands use of the whole body, especially when chopping an over-sized slice of kohlrabi that is totally unsuitable for this particular model. It is for these reasons that I have been spending more hours in the kitchen than at my desk. Creativity can go wild in the kitchen when you limit your ingredients to no salt no sugar no oil and still want to eat. Throw in a little of this, a little of that, add some red adjectives here, yellow prepositions there and Voila, you’ve created a once-in-a-lifetime dish of veggie something that will never be replicated, neither by you nor anyone else. When I’m not in the kitchen I’m reading food blogs. I started with http://healthygirlskitchen.blogspot.com because Wendy, the blogger, is my brother’s sister-in-law and it’s a great blog. From there I kept clicking. I found a medical librarian at www.happyhealthylonglife.com. After every blog post about the endothelial lining of the arteries and Omega-3, I threw out something from the fridge. The truth made me free. I threw out mustard and ketchup. I hurled almond cookies into the trash. After reading an article by Dr. Caldwell Esselstyn Jr., a retired surgeon from the Cleveland Clinic, at www.heartattackproof.com, I threw out the goat yogurt and labaneh, his principle being, “You may not eat anything with a mother or a face.” If I were to obey everything this guru who treated Bill Clinton advises, I would have to throw out my beloved olive oil. Maybe after Chanukah, but not yet. For one who lives in the Mediterranean basin, rejecting olive oil is like deleting air. Sometimes when I’m rinsing the beans, I wonder why one would ever want to leave the kitchen for the desk. You can be so creative in a kitchen. Why write? Nonetheless, something about the writing process pulls my apron strings. Writing is inner and hidden, while cooking is outer and visible. Writing is immeasurable; cooking demands tablespoons. Writing is great for your figure; you can’t eat it. Cooking and writing have some things in common. For best results both depend on a mysterious alchemy and love. Both rely on the Use of the Imagination. Sometimes I will imagine a whole essay before I write it. All I need then, to get me putting words down is a first sentence. Once I imagine that first sentence I’m ready to fly. The finished product never comes out as fabulous as the imagined essay, though, and always needs more drafts. So too with cooking. The imagined tomato sauce is rich, thick, full of Tuscan aromas. I start with a simple onion, but by the time I finish, no white bean with any self-respect would want to swim around in my wimpy saltless sugarless oilless sauce. Unlike the essay, though, I don’t discard this first draft of tomato sauce. Children in China are starving; right, Grandma? And tomatoes cost money, which doesn’t grow on trees. Meanwhile I found a new veggie store on the Castel that has gorgeous fresh produce as good as the shuk and I’m enjoying preparing the food with my new tools and when I’m reading the food blogs and recipes, I’m always thinking about the book I’m not writing. This entry was posted in Not writing, Writing Schedule and tagged Dr. Esselstyn, food blogs, going cold turkey, healthygirlskitchen. Bookmark the permalink. I admire your determination and new-found enthusiasm. Every man should be as lucky as David, both to survive the surgery and to have someone sufficiently loving to take on a new regimen on his behalf. Perhaps you’ll also read some blogs that will convince you that olive oil is actually good for you. It could make your culinary life a little easier, and it might even grease the mental wheels! By the way, how do sharpen a knife with a ceramic blade? And does that chopper really work? And I have one of those choppers… I love making Israeli salad with it, so yummy… I hate cleaning it, though. The little cleaning brush it comes with doesn’t work so well, at least not in my experience. I’d use mine more often if I could clean it quickly. As you dive into the creative world of cooking, remember that your book is being written… just in your mind. As you wrote, “Sometimes I will imagine a whole essay before I write it. All I need then, to get me putting words down is a first sentence.” (Me too, by the way.) I have a story that mostly lived in my mind for three years before I wrote it down a few weeks ago… another floated around in my mind for two years before I felt ready to write. Is that the most effective way to write? Probably not. Could I have sat down and forced the words out earlier? Maybe. Probably yes. So when you wrote, “Meanwhile.. I’m always thinking about the book I’m not writing.” I hope that you don’t mean you’re feeling guilty about not writing, but in fact, that you mean you’re writing it in your mind, turning it over and over, and finding your way through the prose, so that when you finally do sit down to write, you have the necessary ingredients to begin. Evan, I hope you didn’t use oil, sugar and flour . . .
Judy, I don’t share your passion for cooking. Unless it’s for Thanksgiving (with my kids joining in), it tends to make me aggravated (a word my grandmother used so much I thought it was Yiddish). My husband Walt, however, likes to cook. It’s a nice break for him from practicing law. I used to like to cook when I practiced law (it was more like, I like doing anything but practice law, but that’s another story). But you got me with the health angle. We eat healthy around here because I believe you can make a lot of good food with less than 15 minutes of preparation (my personal max). Good health to you and to David. I’m leaving for Chicago tomorrow and hope to meet your relative at the Wilmette library! Good luck in Chicago, Lisa. We’ll compare cooking notes in SD in Dec., I hope. Wow. This is amazing, Rena: for the animals it is an eternal Treblinka. Thanks for sharing. Haven’t touched any part of a cow in weeks. Thanks for creating and sharing this – loved it! A few months ago I went cold turkey on my writing and discovered red lentils. Wow! Just yesterday I painted my kitchen walls “Indian Dance” – a color that has more pizzazz than melon, apricot, mango, persimmon, papaya, or peach. The white kitchen cupboards still rule, but the fiery glow behind them just lights you up. Now that the autumn flavors are streaming in and I’ve expanded my palette of veggie soups, I’m cooking on the keyboard again. Cooking on the keyboard… I love this Sara. Thanks for your commet. Your kitchen sounds awesome.